Organizing our budget is not something I take to lightly. Along the years of organizing our finances I have come to know what works for us and what techniques just aren't plausible (for our family.) One technique that has worked for us since the very beginning is an Excel Spreadsheet. 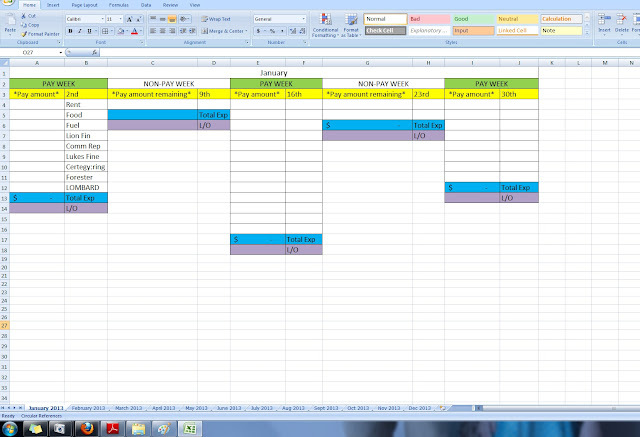 I've tweaked the budget repeatedly over the years, as I find new and more efficient ways to keep track of our expenses via the Spreadsheet, which at the moment is the easiest option, as I can go through and add or deduct an expense without having to change the entire budget as it automatically updates once a change has been made. I also have recently downloaded a free app called iSpreadsheet which allows me to access the budget via my phone on the go! (I simply emailed the budget to myself then opened it on my iPhone via the app) The app comes in very handy if we are at the shops and need to know if we could afford something, I simply open the app, see how much money we will have remaining after all our current expenses are paid and then know whether or not we can afford that something extra. * Note: I'm not affiliated with the app, I just think it's pretty nifty! The third way I keep a record of our expenses/ income is via the calendar/budget section of the my day planner. I have highlighted each pay date with a green sticker, I then see what dates all our bills for that month are due, and organize them to be paid around the 2 pay dates. There are 2 expenses that just aren't negotiable and unfortunately are both due the weeks we aren't paid on, so I budget to have the amount needed for each expense in our Cheque account for when they are deducted. On the other side of this calendar is the budget planner, this is super handy as I can then plan out our monthly budget whilst easily referring to the calendar. Again this is the least used method as I don't always remember to plan out the expenses in the budget section, and generally favor the Spreadsheet for reference. However I do want to start organizing this area more! I also want to start incorporating a cash envelope system into our budget for things such as fuel and groceries, as we tend to overspend in this area without knowing it and I'd like to know just how much we are averaging a week for both of these expenses. So that's how we budget! Do you have a different way of planning your budget? I'd love to know, so leave me a comment below!